Greetings PCEP Partners! Pacific Resources for Education and Learning (PREL) is pleased to present the April/May bi-monthly PCEP Newsletter. We have stories from Palau, Chuuk, Pohnpei, and Hawai‘i. Please also check the web portal to access the resources mentioned in this newsletter, including one recent addition! If you have any comments or questions, please contact Emerson (odangoe@prel.org). 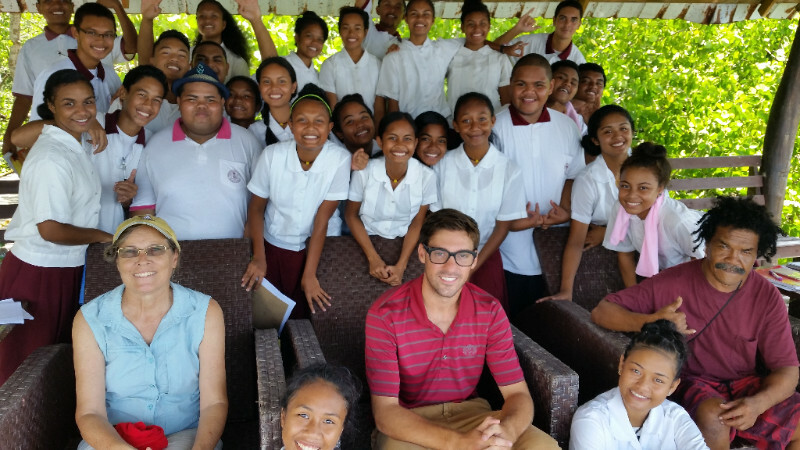 Palau PCEP staff worked with Mindszenty High School science teacher Mr. Aaron Mekker to pilot the recently published book Mangroves: Living on the Edge in a Changing Climate in partnership with naturalist Ms. Ann Kitalong from the Belau National Museum. The group teamed up to review current literature on mangroves in Palau and developed and implemented an eight-day unit of study for 10th grade biology students on mangrove ecosystems in Palau. The unit began with the teacher guiding students through the mangroves book with a series of instructional activities to build their content knowledge about the science of mangrove ecosystems. Students also reviewed the mangroves chapter from Ann Kitalong’s book A Personal Tour of Palau and also reviewed the mangroves section in her recently published Native Trees of Palau. Ann then presented to the class and shared the community participatory research projects on mangroves she has been working on in partnership with local fishermen and women in her village who have extensive Indigenous knowledge about conservation and management practices. After the presentation, students had opportunities to dialog with the presenter and their teacher to learn more about current threats and management practices for mangroves. The following day, students were guided by Aaron, Ann, PCEP staff, and volunteers from Belau National Museum on a tour of a mangrove trail that Ann had developed in partnership with a resort in her community. During the tour, students were asked to collect data on different species of mangroves and write a haiku poem to document their experiences. 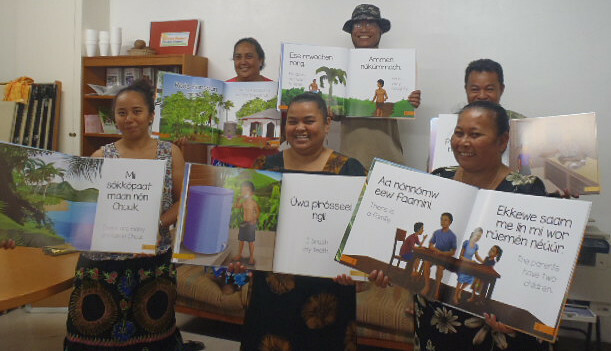 PCEP supported the development of three bilingual texts from PREL’s Language & Content (L&C) Learning Across the Curriculum project, which is a multi-year effort in Chuuk funded by the Chuuk Department of Education (CDOE). The project focuses on how language plays an important role in learning across content areas to support academic success. PREL works closely with a core group of CDOE staff to build their capacity in addressing academic language and literacy learning in both the local language and English. One output of this project is the development of locally relevant bilingual texts for kindergarten (K5) to grade 8. 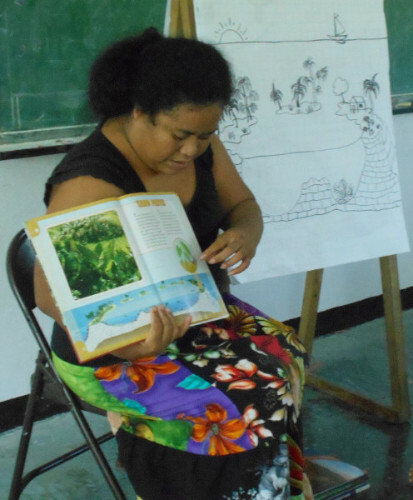 The texts build language and literacy skills in the local language and English, through topics important to students, their communities, and Chuuk. There are four texts in each grade, and each text focuses on a topic from one of the following themes: traditional stories/legends; environment/climate change; plants and animals; and daily island life. Three texts in particular are co-sponsored by PCEP: Pwórausen Fáán Nááng (Weather), Ráás me Efen (Seasons), and Iráán wón Fénúweei (Plants on My Island). The former text is written at the K5 level, and the latter two at the grade 1 level. All of these three texts are written in Chuukese and English. These texts can be used to build students’ understanding on weather, climate, and the environment, which is foundational to more complex concepts related to climate change at upper grade levels. For example, Pwórausen Fáán Nááng (Weather) gives K5 students the tools to talk about weather now, to make observations in the past, and to predict for the future. Such tools include formulaic sentences that are emphasized through repetition in the text, such as Ifa pwórausen fáán nááng ikánáái? (How’s the weather today?) By developing K5 students’ skills in observing and comparing weather at relatively short scales (i.e., immediate past and future), this provides a foundation for understanding climate patterns and change at much longer scales (i.e., 30 years). Each text is conceptualized and written by CDOE staff, with technical assistance from PREL on brainstorming, writing, and reviewing; local knowledge from community members to enhance the content; and technical assistance from Island Research & Education Initiative on reviewing, layout/illustration, and printing logistics. The first round of development and publishing has produced seven books and two posters. PCEP staff provided additional resources to support content enhancement, review, and illustration for the three aforementioned texts. As the school year winds down, the Pohnpei Teachers Learning Community (PTLC) takes look over the past year to reflect on their growth as a community of learners. There are a lot of positive things to be said about the team, particularly their interest and persistence in the face of many challenges. After teaching a full load of classes each day, the team comes to meet once a week at the PREL Service Center. For many of these teachers, this requires them driving several miles to be able to meet together. With limited knowledge of climate change, the team focused on deepening their knowledge and understanding of climate change concepts. Time was dedicated to learning from electronic resources, listening to presentations, speeches, and poems on the subject, as well as attending webinars. As they become more knowledgeable on the subject, they developed lesson plans—using PCEP and Water for Life books—to teach in classrooms, and they shared with each other. The teachers would debrief on each lesson plan shared, making sure they are aligned to the state standards, and they would discuss ways to adapt each lesson for different grade levels. The topics of the lesson plans shared range from marine and fresh water resources to high island forest habitats and impact of deforestation, to comparisons of different environments and habitats. Some lessons include using pictures in the texts to introduce concepts of environments and habitats for lower grade clusters, prior to taking kids outside on field trips for real life experiences. For a PLTC member named Marion, in her class, she uses pictures in the books to activate the students’ prior knowledge and to compare different habitats found on small islands. Marion also uses the pictures as resources for identifying organisms and habitats to teach using bilingual strategies (in Pohnpeian and English). Marion remarked, “the kids love the books and I find them very useful. I don’t even know the names of some of the organisms in the books, so I am learning from them, too. I only wished they are written in both English and Pohnpeian!” Such a perspective from Marion highlights the potential of PCEP resources that are printed only in English, since the process of translating them into local languages—thus developing brand-new bi/multilingual materials—can be a place-based endeavor that promotes creativity and exploration for teachers and students alike. Close your eyes and imagine freshwater flowing down a mountain, into a valley, creating a river that then flows onto the ocean. The rivers are full of life and a source for irrigation and fertility. This watershed system is found on high islands in the Pacific region. Humans imitate this watershed system when they develop and create aquaponics systems. Water flows, plants grow, and the fish provide fertility. 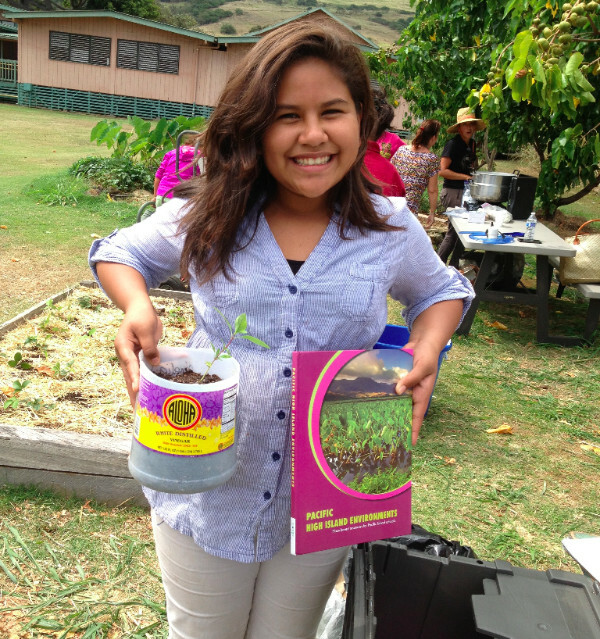 Carly Wyman—a FoodCorps service member and garden teacher at Na‘alehu Elementary School, Hawai‘i Island—collaborated with Hawai‘i’s Sea Grant Extention Assistant, Chantal Chung, and PREL Ecoliteracy Specialist, Dr. Koh Ming Wei, to organize the Na‘alehu Elementary School Earth Day 2016 celebration. More than a dozen families and another dozen faculty members participated. There were three stations: (1) aquaponics system, (2) garden bed preparation, and (3) a plant give-away. By the end of the celebration, the participants installed the system, weeded, and prepared a large garden area (20’ by 20’), and transplanted plants to take home to share. We used both the Pacific High Island Environments and Our High Island Home books to compare and contrast a natural watershed system with the human-built aquaponics system—how can we imitate Nature? Every child who attended was given a book to take home. Several parents who were there commented on the beauty and relevance of the books. They especially appreciated the illustrations of local (Hawaiian) plants and animals and the clear presentations of island land and water systems, which are different from continental systems. To all the students out there who have read these PCEP books—would anyone like to do a book report? It would be great to hear from you what you have learned by exploring both your place and these books! The Chuukese-English bilingual texts mentioned in the second story above (“PCEP Supports Bilingual Text Development in Chuuk”) are now added to the PCEP web portal Resources page at http://pcep.prel.org/resources/. This now brings the total number of resources to 52 in the database! Be on the lookout for more materials to be added soon. Don’t forget to like us on Facebook for photos, articles, and announcements on climate in the Pacific region. We encourage you to share this newsletter with your colleagues; use this link to subscribe: http://eepurl.com/-Xx0n. Copyright © 2016 Pacific islands Climate Education Partnership, all rights reserved.